Choosing a resistor for pulse applications can be tricky business. 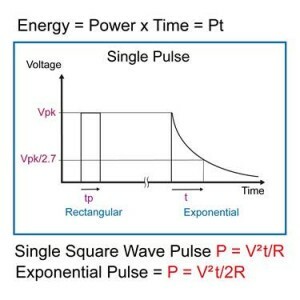 What is the magnitude of the pulse? How long does it last? How often does it repeat? What is an acceptable resistance range? And then there are the multiple resistor technologies to consider. A typical application is the charging and discharging of capacitors in a circuit. During the charge or discharge of the capacitors, the resistor will be required to dissipate the energy of the pulse until the voltage across the capacitors has stabilized. This can be further characterized by the equation, E = ½CV2 where E is the energy in joules, C is the capacitance in farads, and V is the peak voltage. We typically define a pulse as an event of less than 0.25 seconds. The resistor’s ability to handle short duration pulses is directly proportional to the mass of the resistive element, whether that be thick or thin film or even resistive wire. Simply stated, the more massive the resistive element the greater the ability to handle a short duration pulse. For pulses exceeding 0.25 seconds the power rating of the resistor becomes increasingly more critical than its pulse handling capabilities, due to self-heating of the resistor body in addition to the resistive element. For short duration pulses, wirewound resistors have a clear advantage over alternate technologies due to the relatively higher mass of resistance wire versus either thick or thin films of the same resistance value. Riedon does not publish pulse ratings for our wire wound products, instead we utilize special construction techniques and an internally developed calculator to determine the joule rating of a part for a specific application given its case size, resistance value, winding style (standard or non-inductive Ayrton Perry), and resistance wire type. We have developed pulse rated wire wound components for applications as diverse as medical defibrillators, power conversion, defense, and aerospace.